AMS 35 Car wash Vending Machine The AMS 35 Car wash Vending Machine is a perfect machine to have around the car wash to serve your customers extra supplies while they are detailing their freshly washed cars. The AMS 35 Car wash Vending Machine is customized especially for the car wash supplies that you sell. No more two items falling out at once when the spirals in the machine are the right size and set correctly. . This AMS 35 has been built in our plant under the professional eyes of our experts and therefore we can guarantee you a wonderful experience having the machine around and vending your favorite car wash items through it. The AMS 35″ Carwash Vendor vends 16 selections of Wide carwash products and 16 selections of smaller carwash items. AMS backs their machines up by having the best snack machine warranty in the industry 3 years on all parts with the exception of fluorescent bulbs, glass, and paint finish. 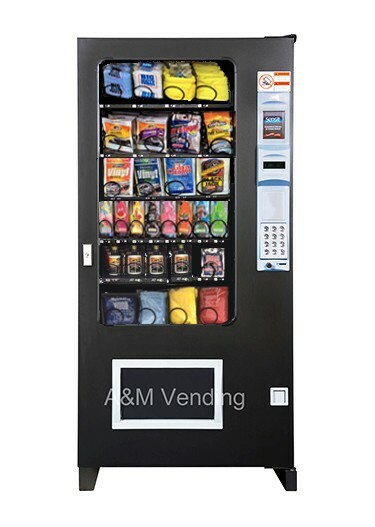 The AMS 35″ snack machine has a capacity of 508 Units. Double Pane Glass in Chilled Units. “Energy Sensit” is installed in every AMS machine. You save energy you save $$$. We are the authorized factory distributor for AMS. Our telephone technical support and parts team will be happy to assist you with any issue you may have 8am – 5pm est as long as you own the machine. 3 year parts warranty on the machine excluding paint finish and flouresent bulbs. Shipping not included.